Promoted: Philips Fidelio B5 soundbar speaker | What Hi-Fi? 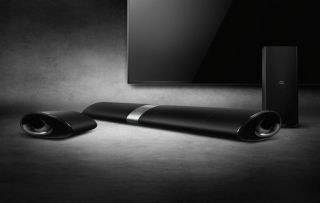 The Philips Fidelio B5 soundbar has been awarded a Best of Innovation award at CES 2015, and it could solve your surround sound setup dilemmas with its innovative detachable wireless speakers. The B5 is the latest addition to the premium Philips Fidelio range and is the brand’s most versatile soundbar yet, featuring two fully-wireless detachable speakers which can be used as standalone Bluetooth (aptX and AAC) speakers when not on movie duty. As a single unit with wireless subwoofer the Fidelio B5 delivers more punch to sound for TV and music, but when it’s time to watch a movie you can detach the two wireless speakers and enjoy a helping of 4.1 channel Dolby Digital surround. The convenience factor doesn’t stop there as with its automatic calibration feature you can place the speakers where you want, hit the calibration button on the remote and enjoy perfectly balanced surround sound even with a less-than-ideal room layout. And fret not about battery life; once detached the speakers can deliver up to five hours of music and up to 10 hours in movie mode, so you can settle in for a serious cinema session.